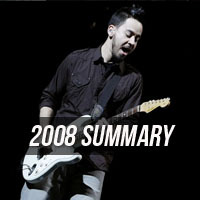 2008 was another pretty big year for Linkin Park. They kicked off the Minutes To Midnight arena tour in Hannover, Germany on January 16th and premiered a few more songs live, such as "Valentine's Day", "In Between" and a short cover of The Cure's "Just Like Heaven" featuring Mike playing the keyboard and doing vocals. They also brought back A Place For My Head back into the setlist for the first time since 2004. The last highlight of the setlist included "What I've Done" opening the setlist for the first time, with a heavy ambient-noise based intro that easily won over the crowd. The band played some pretty big venues in Europe, such as the Kölnarena and the O2 Arena. The entire tour was a highlight in the band's history because as far as we know, this is the first tour that they completely sold out (every show). After filming their live video for "Given Up" on the UK leg of the tour, the guys headed over to kick off the North American Winter Tour in Omaha, Nebraska. The tour was aiming at hitting cities the band hasn't played in in a while, like Manchester, NH, Lexington, KY, Oklahoma City, OK, Nashville, TN, and Sacramento, CA. The biggest highlight of the tour is easily the fact that the band played on a 360 degree stage, and even sold out three shows of the tour - Montreal, QC, New York City, NY, and Los Angeles, CA - which meant that they played to a full circle of audience members. Unfortunately, the past repeated itself in the way that when things were going well for the band, Chester got tracheobronchitis in February, and the band was forced to cut the Oklahoma City, OK show short and then cancel the next two shows in Albuquerque, NM and El Paso, TX. After abbreviating setlists for the next few shows, the band ended the tour on a strong note with a full setlist in Sacramento, CA, putting an end to the tour and giving the guys a much needed three month break. During this time, Chester held his annual Club Tattoo party in Arizona, and played with his solo band Dead By Sunrise, debuting two new songs called "Walking In Circles" and "My Suffering". In May, the band released a new single/collaboration with Busta Rhymes entitled "We Made It". Right before the June European Tour kicked off, they played a secret show at Third Encore, their rehearsal space, for 14 fans, and debuted We Made It live. Fake setlists floated around after the show for the summer's Projekt Revolution Tour, containing such songs as "No Roads Left", "Announcement Service Public", Easier To Run, an acoustic rendition of "Numb" and "By Myself". Later on, these turned out to be all untrue. In June, Linkin Park headed to Europe again. They played in a lot of countries that they haven't played in for many years, or haven't played in ever. Some of these countries were Lithuania, Spain, Greece, Italy, Austria, and Ireland. Unfortunately, the band had to cancel two shows in Sweden and Switzerland due to Brad having an ear infection. This was the 3rd time that Linkin Park had to cancel in Sweden out of 4 scheduled appearances ever, so many fans were left disappointed. The tour had a few setlist changes, including "Reading My Eyes" being brought back, "One Step Closer" and "Lying From You" having new intros, and "Pushing Me Away" studio version returning to the setlist. The band then debuted for the first time, Projekt Revolution in Europe. They played three of these in Germany - München, Berlin, and Düsseldorf, and one in England - Milton Keynes, which was filmed for the CD/DVD release entitled Road To Revolution. Linkin Park then took about a week and a half off, and then played two festival shows in Canada in Toronto and Québec, each show highlighted with something interesting. Toronto featured the band starting the setlist off with three piano-style songs ("Breaking The Habit", "Pushing Me Away", and "Hands Held High") due to only three members being at the actual show at showtime. After "Hands Held High", the rest of the band appeared and a normal setlist was kicked off with "What I've Done". Near the end of the show, the lights went off on the bridge to "A Place For My Head" and came back on for the ending of "One Step Closer". Québec featured the band playing in heavy rain, but it didn't deter any of the thousands that showed up for their favorite band. After successfully rocking Canada, the band kicked off Projekt Revolution in the US, starting in Mansfield, MA on July 16th, and ending in Woodlands, TX on July 24th. While it was shorter than the previous year's Projekt Revolution Tour, there were several highlights of the tour. Chester joined Chris Cornell just about every night during his set on "Hunger Strike", and Chris returned the favor on "Crawling" during Linkin Park's set. Chester also performed "The Outsider" with ASHES dIVIDE a few times. Unfortunately, Busta Rhymes had to leave the tour early due to label troubles, but the first few shows were treated to "We Made It" live. Street Drum Corps joined the band to open the set and came back out for the last song as well. While the band seemed exhausted at the end of the tour, they vowed to play in Las Vegas, NV for a Verizon Remix Contest winner, and one last short run of five shows in Asia for the Music For Relief Asian Benefit Tour. The day before the Las Vegas show, Chester slipped two discs in his back, which resulted in the rest of the shows for the remainder of the year being canceled. Hoping to still end the year on a bright note, the band released a CD/DVD of the Milton Keynes show on November 25, and headed to the studio to record the new album earlier that month. 2008.06.29 Milton Keynes: Jay-Z, Pendulum, N.E.R.D., Enter Shikari, The Bravery, Innerpartysystem. Asian Tour 2008 (and Las Vegas 2008.10.06): Opening bands are unknown for the canceled shows. 2008.03.01 Albuquerque - Reason: Chester was sick. 2008.03.02 El Paso - Reason: Chester was sick. 2008.06.14 Hultsfred - Reason: Brad had an ear infection. 2008.06.15 Interlaken - Reason: Brad had an ear infection. 2008.06.24 Istanbul - Reason: Mannheim show scheduled for this date instead. 2008.10.06 Las Vegas - Reason: Chester slipped two discs in his back. 2008.10.12 Shanghai - Reason: Chester slipped two discs in his back. 2008.10.15 Wuhan - Reason: Chester slipped two discs in his back. 2008.10.17 Taipei - Reason: Chester slipped two discs in his back. 2008.10.19 Beijing - Reason: Chester slipped two discs in his back. 2008.10.21 Macao - Reason: Chester slipped two discs in his back.